We invented the glass-carrying rack and named it the frail. With over 30 years experience, Supertrucks is the UK's number one manufacturer of vehicles built to carry glass. Our panel van racks are produced from lightweight material to maximise your payload while maintaining our high quality finish. Installation can be undertaken while you wait. Contact our sales team for more information. Custom bodies can be built on vehicles from 3.5 to 32 tonnes gvw. Sides can be sloping to accommodate an external rack or vertical to maximise space. Roof designs can be concertina opening or fixed. Our securing systems can be integrated to your requirements with either our patented scissor clamp or sliding rubber wedges. Inclinators are fitted to all our vehicles. Supertrucks Rental offers 3.5-tonne Mercedes-Benz panel vans with external frails, roof racks with ladders, and internal glass-carrying racks, one full length and the other shorter to allow side door access. Contact Supertrucks for our competitive rates and availability. All glass carriers fitted by the Bevan Group have been cleared by the VCA and we are the only company that complies with current Type Approval regulations. The potential advantage in terms of reduced lead time is huge. The Bevan21 reduces wind resistance while maintaining cubic load volumes, with features including a curved roof and a specially moulded air deflector and cab collar. The design is capable of achieving fuel savings of up to 15 per cent (independent test of 11 tonne version) and even saves fuel on multi-drop runs. 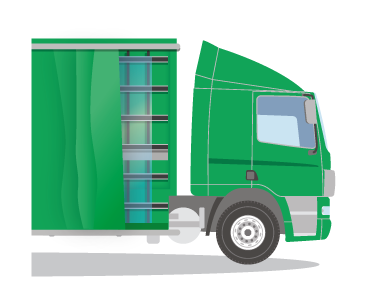 The Bevan21 is contributing to many commercial vehicle operators’ carbon reduction targets, including major names such as Argos and AG Barr.